To know why the mind is normally unable to perceive something completely, let’s see how it works. Typically the thoughts (including the memory) are connected to each other and there is always a tendency for forming new connections and strengthening the old ones. Thoughts can hardly exist without being connected with an existing thought (we make use of this aspect while accessing the memory). Any stimuli could potentially evoke a range of thoughts in the mind. Assume that these thoughts arise in a sequence. But then there is also a strong urge to connect the ‘first thought’ with an existing one in the mind. Normally this urge is very strong and beyond the control. So abandons the act of forming new thoughts and moves to connecting the thoughts. The act of allowing as many responses to occur in response to a stimulus without the unconscious urge to form an association is the essence of ‘presence’. As soon as the first thought occurs (the first few..) there is an urge to form an association with thoughts in the memory. The association could be based on an event, appearence, place, person, emotion etc. The next thought again tend to form subsequent associations till either the thought links become weak or an exteranl trigger interrupts it or the mind suddenly becomes concious. The relationship to creativity is simple. Creativity is about forming new thought associations and patterns is about sticking to old associations. The former is the creative way and the latter is the productive way- at deep down this is what differentiates creativity and productivity. You get to choose one, not both; at least simaltaneously. This entry was posted in Creativity, Mind, Mindfulness, Patterns, Thinking and tagged Awareness, Connecting thoughts, creative mind, Creativity, Logical mind, Memory, Mind, Mindfulness, Observation, Patterns, Perceptions, presence, Present Moment, Productivity, Productivity vs Creativity, Thought associations, Thought patterns, thoughts, thoughts and memory, Watching on February 28, 2010 by Sajeev. In the postHow much of what we see, we ’see’?,I had mentioned that we actually see a very small percentage of what we see physically; the remaining things are filled up by the mind from memory. Close attention to details is a quality of creative minds and this is very much related to presence. Our minds are programmed to respond to triggers instantaneously; creating a chunk of thoughts followed by any trigger. Another trigger (unless it is too important to miss) that comes during this chunk is ignored. 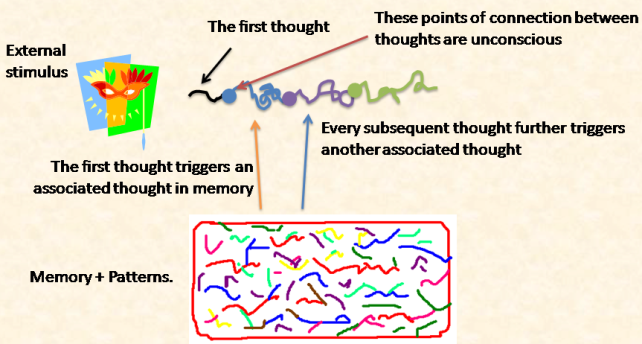 Sometimes the thoughts that follow the trigger are related to the trigger itself; so that the mind is possibly making up the same stuff that the missing trigger contained! 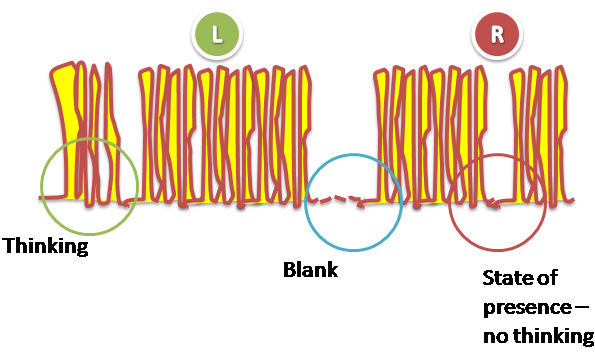 Fig 2: shows how a typical mind responds to the triggers. What is in blue is recognized by the mind. What is in yellow is the thoughts generated in the mind in response to the triggers. And the brown ones are the triggers missed out because of this thinking. Why is this superior? When the mind fills ups the missing details about an object, mind can’t resist being biased. There is an effort to make an object ‘what we would like it to be’. But when we are ‘present’, we see the object as it is. The object could be anything – a person, an event, a situation or a physical entity. The physical space you see in the image represents the space between thoughts. Space between thoughts is called time. This entry was posted in Creativity, Mind, Mindfulness, Thinking and tagged Creative thinking, Creativity, Innovation, Mind, Mindfulness, Pattrens, perception, presence, Present Moment on February 24, 2010 by Sajeev. Let me digress a bit to settle a thought that came in after the lat post. In the post I mentioned about the technique called ‘Forced Association’, which is a popular technique for ideation. (Forced Association is a technique in which a series of random words are forced into association with the topic under investigation. These artifically paired words are then considered for creative possibilities). I have never been a fan of anything like this. For me quality associations are spontaneous, natural and effortless. The objective of the game is to change something to something else. For e.g Change CAT to DOG. The rule is: you begin with the first word, change only one letter at a time to have another meaningful word, till you reach the second word. Who does it with the shortest number of words is the Winner. Want to try one for your own? Try changing TRUTH to FALSE…. This entry was posted in Creativity, Mind, Thinking and tagged Brain, Creativity, Froced association, Innovation, Mind, Nature of Mind, Present Moment, Thinking on February 23, 2010 by Sajeev. I have already mentioned in the previous posts this point : that ‘association’ is the key to creativity. When you look at examples for innovation, you would find a lot of them pointing to ‘association’. A self cleaning glass inspired by lotus leaves is a good example. If you need a famous one, you have the benzene ring. Steve jobs came up with the idea of fonts while doing some calligraphy lessons. In each of these cases, there was an association of two things which brought forth a new fresh idea. You can find ‘association’ as a key element in many creative works, especially literary and visual forms. And needless to say, for those logical minds, there is this technique called ‘forced association’ – yes you don’t need to have the art of associating, but put yourself through a technique and you might hit upon something brilliant. To be frank, like most of the other systematic innovation techniques which try to force the mind to do something different, I have not really seen this produce anything really creative. It is interesting for people who have been using mind in a specific way to do something like this, but I firmly belive that we cannot imitate a creative mind. Few of us settled down around a table with a plate of chats and coffee each in our office (for those who do not know, a chat is typical Indian snack which is typically a mixture of potato pieces, crispy fried bread, gram bean , yoghurt and some spicy masala powders. None of them are eatable individually, but a chat is usually very tasty (You can find some receipies here)) We were hungry, but as we began eating it, everyone looked at each other. It didn’t taste great. But no one spoke anything. There was a total silence for a short while. Then someone said softly “A committee is a group of people who cannot do anything alone and then they come together to find that even then they cannot do anything”. Everyone burst out laughing. You can see , what he said contained the essence of the situation. I was talking to a colleague about what is called ‘cognitive dissonance’. Another friend of mine joined us in the conversation. To explain the meaning of ‘cognitive dissonance’ I told him the following example – Imagine you walking past a beggar on the street. One part of your mind says – be compassionate, give him something. But the other part says – no, you are encouraging begging. Now you have two conflicting thoughts simultaneously in the mind and you do something to escape from this uncomfortable situation- like walking fast. My colleagues smiled; he had got what I was telling. Then my friend said – you know what Swami Vivekananda said about begging?…. It is evident that associations happen at different levels : words, rhymes, shapes etc to begin with are common and easy. But what is tough are associating by patterns, deeper meanings etc. And the latter plays a key role in creativity. Is there something that helps you associate things better? Yes. You associate things when you are present, when you perceive something wholly without thinking. And this happens in the lives of any creative people, there are times they come across a trigger that is potent enough to unfold something great in them. And the creative people spent enormous time in fact in search of these triggers. Will continue in the next posts.. This entry was posted in Creativity, Mind, Mindfulness, Thinking and tagged Associations, Awareness, Creativity, Forced association, Mind, Mindfulness, Patterns, presence, Present Moment, Systematic Innovation, Visual associations on February 22, 2010 by Sajeev. Though I am inclined to believe that the two brains (the right and the left hemispheres) play a role in the ‘present moment’, I am not really sure. The comment from Murali on the last post (Presence) forced me to think over this again and here is a hypothesis. 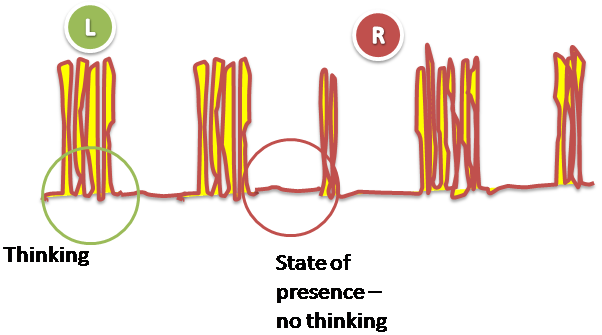 The pulses represent thinking and the left brain is dominant here (marked L).Then there are gaps (red circle, marked R) where the ‘thinking’ shifts to the right brain. Here there is no ‘thinking’ the way we know it, but there is intense awareness. (there are also times when we draw blank may be out of exhaustion/sleep deprivation etc (marked in blue circle) – this is not a state of presence). These are the creative spaces where the ‘Aha’ moments can occur. But typically in most of us, the left brain is so dominant that the ‘gap’ or the ‘state’ of presence is hardly there. There is so much of noise out there, mainly because after some time thinking becomes an unconcious and involuntary activity, which needs to keep happening. There is more balance here, the ‘thinking’ shifts between the two brains. This is what is needed to happen in ideation sessions for good ideas to come out. This is just a hypothesis. There are techniques which can make this shift for sure. But I am not clear if ‘intelligence’ has got to do anything in this.. Looking forward to your thoughts on this.. This entry was posted in Creativity, Mind, Mindfulness, Thinking and tagged Aha moment, balanced thinking, Clarity of thought, Creative intelligence, Creativity, Ideation, Intelligence, Left Brain, Mindfulness, Nature of Mind, presence, Present Moment, Right and Left brains, Right Brain, shift in thinking on February 17, 2010 by Sajeev. We are familiar with the term ‘presence of mind’. We often use this term to describe an intelligent action by someone especially in a moment of crisis. This implies that the person neither was carried away by the situation nor did not react emotionally, but rather came up with something unexpected and deeply powerful. If you ask them later (someone whose presence of mind saved him/her from a life threatening situation) they wouldn’t be able to tell you how they could act the way they did. This is the most common form of presence most of us know. What really happens here? If you closely observe such a situation of presence, you will observe that for a moment there was no thinking but there was perfect alertness. This is the state of presence ;a state of intense awareness and the key to present moment. When thoughts stop, there is a higher form of intelligence that suddenly charge.Many acts of bravery happen in this state. There is a perfect flow to what you do without any planning, rehearsal or even thinking. But what has this got to do with creativity? Most of have heard of the “Aha” moment, where people get solutions for a problem that has been bothering them for long, simply out of the blue. Those “Aha’ moments are infact the states of intense presence. It is not a coincidence that the most of the Aha moments come during activities where one concentrate intently like shaving, waiting under the shower for those first droplets to touch your skin, being with the nature, engaging in some form of dangerous sports etc. If there is a problem that is really bothering you and is not solvable how much ever you attempt, it is very very likely that during one of the next ‘present’ moments, the solution will simply occur to you, because during those moments there is a greater intelligence in command. The other way to put this is : Suppose an event happens and you already have a mental pattern corresponding to that event in the mind. Now you do not let the pattern execute. So you just have the event, as it is. And you do this not by force, but by gentle watching. And watching the thoughts is the simple way to overcome the patterns and is the key to ‘presence’. But those who have attempted to watch your thoughts will tell you how hard it is. The mind is so tricky and before you know, there is something already going on there. So in many ancient traditions people figured out several methods that can workaround without confronting the mind.. A most common example is paying attention to breath, since breath is something that happens in presence moment. This is the basis of the vipasana meditation in Buddhism. In the book ‘The seven Habits of Highly Effective People’, Stephen R Covey describes an incident where he comes across a book which had a paragraph that powerfully influenced the rest of his life. “I read the paragraph over and over again. It basically contained the simple idea that there is a gap or space between stimulus and response, and the key to both our growth and happiness is how we use that space”, he writes. What he describes here is the state of presence. It is about creating or bringing space. At an external level, it is about bringing space between an event and response, or around a situation. Deep inside it is about recognizing space between one’s thoughts. By bringing space, it means that there is a gap of no-thinking, a moment of intense alertness. It is like someone watching your thoughts. And during this space, there is a superior form of “thinking” heppening, which is different to thinking the way we know and it does not use language. And most importantly, it does not use the logic.And this is the creative intelligence. While most of had this space of creativity as children, we have lost it some where on the way. This is also a space of immense joy and most of us cherish a longing for it deep within. But it is possible to create that space again, which is something worth attempting to. Because it is a journey inward and is immensely rewarding. This entry was posted in Brain, Creativity, Mind, Mindfulness, Thinking and tagged Aha moment, Awareness, Blocks of creativity, Breath awareness, Creative intelligence, Creative thinking, Innovation, intense presence, Living in the present moment, No-thinking, Patterns, presence, Presence and creativity, Presence of Mind, Present Moment, reactive patterns, sense of wonder, Vipasana on February 15, 2010 by Sajeev.